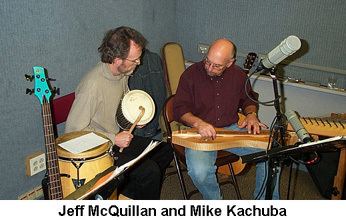 In these days of Major League Baseball playoffs and the upcoming World Series, we scheduled our own musical doubleheader: Former Connecticut State Troubadours Mike Kachuba and Jeff McQuillan in the first hour and Erik Balkey and Laurie MacAllister in the second hour. This show actually went on until 12:30 or so we could set up and break down for each grouping. Mighty thanks once again to WSHU Chief Engineer Paul Litwinowich who did yeoman’s work in mixing sound for two very different sets of performers. Mike Kachuba, a dear friend who first appeared on Profiles in Folk in 1982, has just released a new album that evolves around an exciting concept: Mike was commissioned by the Florence Griswold Museum in Old Lyme, CT that asked him to interpret in song paintings that were part of a special show from their collection, “The American Artist in Connecticut: The Legacy of the Hartford Steam Boiler Collection.” Mike then presented his songs in concert as part of a series of events centered on the exhibit. The result of all this was a wonderful album, “The Fisher Boy”, with Jeff McQuillan accompanying on a host of percussion instruments, bass and harmony vocals. We got them in Studio A to offer up live selections from the CD as well as a few other tunes. 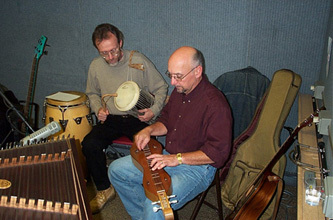 Mike played hammered dulcimer, guitar and harmonica and Jeff played a variety of instruments that filled Studio A, including a trumpet. It was the first time we’ve had live trumpet on Profiles in Folk! 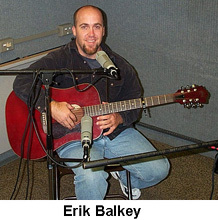 For the second “game”, nomadic singer-songwriter Erik Balkey, who was with us as part of an “in the round” program in July stopped for a solo visit to promote upcoming concerts in the region and brought a friend, New York City singer Laurie MacAllister, who is poised to release a new album of cover songs. Their soft, sensitive music was a perfect ending to a delightful and informative evening of music. Second hour. With Erik Balkey and Laurie MacAllister.